This portrait by Wiley is a little different, in that he doesn’t depict Michael Jackson wearing hip hop street clothes. 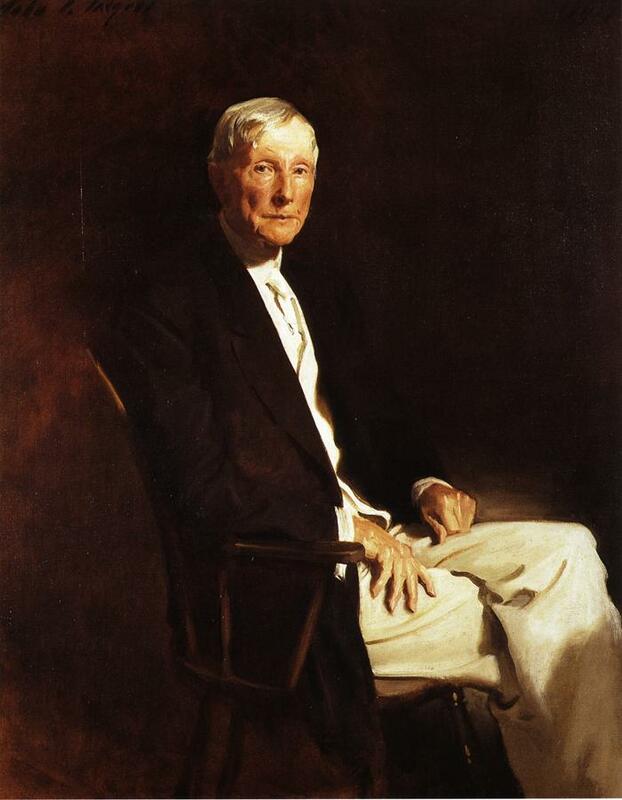 Jackson actually commissioned this portrait in 2008, but never saw the completed work. J thinks that the inclusion of the cherubs (instead of the angel in the Ruben’s painting which inspired Wiley, as shown below) is fitting, given that Jackson was accused of sexually abusing children. I really doubt that Wiley intended to make that reference, but it’s an interesting thought. 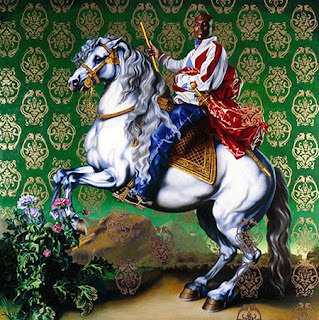 The painting was finished after Jackson’s death in 2009 and sold that same year to German collector for $175,000. My favorite thing about this portrait is that it depicts Jackson at the height of his career. I think the armor and pose totally scream “I’m bad, I’m bad, you know it!” Man, you can’t help but love MJ’s early stuff. 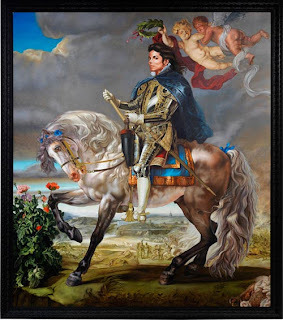 He was the Prince of Pop, and a royal equestrian portrait is fitting. Anyhow, you can read more about this portrait here and here. 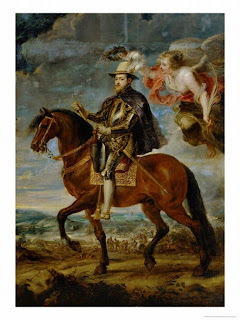 I have to admit, I think Rubens has created a lot more powerful horses than the one in this painting. Wiley’s horse has a lot more presence than the one shown here. 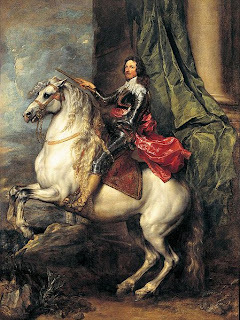 Maybe the puny horse accounts for why this portrait is not very well-known. Anyhow, if you’re interested, the Prado Museum has some discussion about the restoration of this portrait here. 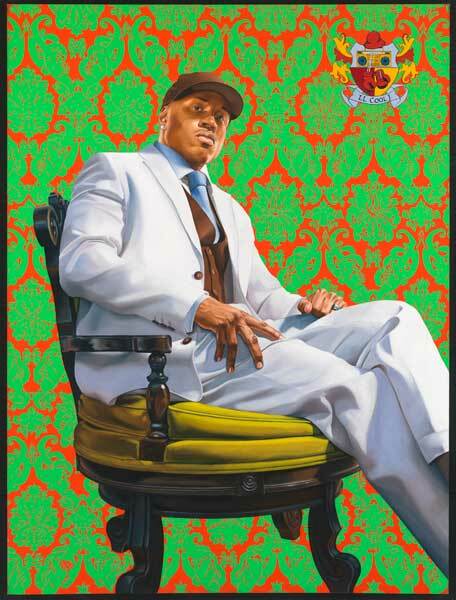 You can see more of Wiley’s work on his website and read a little bit more about him on this page of the National Portrait Gallery’s site. What do you think of Wiley’s portraits? Do you think they raise interesting questions about identity and personal image? This July, Turner’s painting Modern Rome – Campo Vaccino (1839, shown above) will appear on auction at Sotheby’s in London. This auction news has attracted quite a bit of attention as of late – and for good reason. First of all, this painting is absolutely stunning (don’t you agree?). 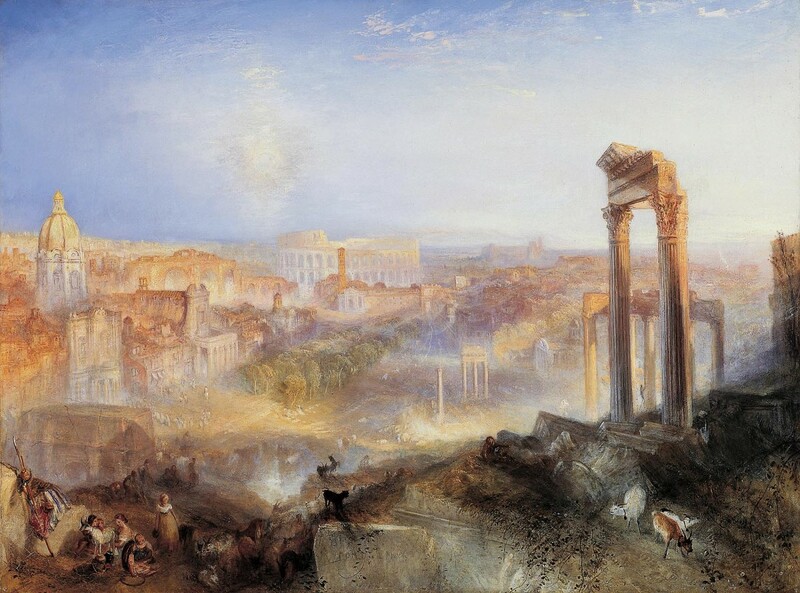 Second, this is the last painting of Rome that Turner ever made. Turner traveled to Italy multiple times in his life, and even exhibited a small group of his work in Rome. Therefore, this last painting of Rome is historically important in regards to Turner’s career. And finally, this upcoming auction is significant because this painting has only been on the market one other time, back in 1878. Sotheby’s projects that the work to reach somewhere between $18 million and $27 million in the upcoming auction. I sure wish I had that kind of cash lying around. I can only hope that this work will be purchased by a museum (or bought by a collector who permanently lends the painting to a museum). It is such a beautiful painting and so representative of Turner’s interests in light and color – it doesn’t seem right for the canvas to end up in a private collection. I think lots of people should have the chance to enjoy this painting. P.S. I discovered the Art History Today blog this past week. It’s really interesting and I highly recommend it. 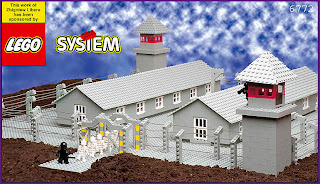 Next week my new students will learn a little bit about Zbigniew Libera’s project LEGO Concentration Camp (1996). 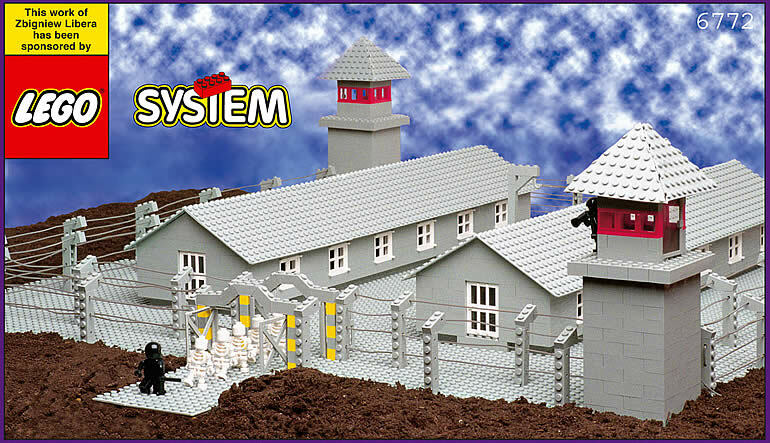 Libera worked with the LEGO corporation to create a seven box set of different buildings within a concentration camp. Although much of the set contained LEGO materials, some of the faces of the guards and prisoners were manipulated with paint (to suggest expressions of sadness or glee). The last box of the set was full of personal objects and possessions, inspired by the loots that were taken from prisoners during the period. Unsurprisingly, there was a lot of controversy around this project. You can read a little bit more about the controversy and background of the project in this article (start about 1/3 of the way down the page). Even LEGO launched legal complaints against the artist. In some ways, it seems like “anything goes” in relation to contemporary art, especially when it comes to readymade/found objects. Today artists seem to scramble for any kind of readymade/found object that hasn’t been used (or hasn’t been used in a certain way). Libera’s work is an example of how nothing can be considered taboo in the contemporary art scene, not only in its readymade medium but also in subject matter. What do you think of Libera’s work and idea? To be honest, I haven’t completely made up my own mind. I fluctuate between being offended and feeling that Libera is bringing attention to the Holocaust in a creative way. The thing I don’t like to envision, though, is the possibility of little children playing with a LEGO set like this one. And I think that reminder of childhood innocence is part of Libera’s point. I haven’t had much chance to think about art over the past two days – which is ironic, because I’m busy prepping for an online course in contemporary art. Instead of thinking about Jeff Koons and Damien Hirst, though, I’ve been battling with my computer over technology/formatting issues for my recorded lectures. Bah. Anyhow, today two friends sent me variants of the same article (see here and here), and I welcomed the distraction (thanks, Kiersten and Rachsticle!). The articles discuss an unusual study which revolves around the food portions, particularly those in depictions of the Last Supper. 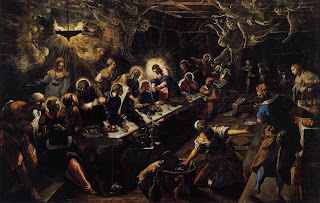 Two brothers, Brian and Craig Wansink, analyzed and compared Last Supper scenes over the course of 1,000 years (including one of my favorite paintings, Last Supper by Tintoretto (1592-94, shown above)). The researchers used the heads of the figures as a basis for comparison, and then measured the size of plates and entrees accordingly. As a result, it was discovered that the portions for meals increased gradually over 1,000 years: entrees increased by 70% and bread grew by 23%. Incidentally, the size of plates also grew by 65.6%. Pretty interesting stuff. It looks like industrial farming and fast food chains are not solely responsible for the size of today’s food portions. Instead, portions seem to be a product of history. And hooray that art could help with the research for this project! Once again, art comes to the rescue!